WINECHILL, the design wine chiller, is a must-have for wine lovers who appreciate a good glass of wine at the perfect temperature and served in style. The temperature at which a wine is served is important. A wine served too cold will lose its taste and aroma. Too warm and you will only taste the alcohol. WINECHILL keeps your wines at the perfect temperature without the messiness, and unreliability, of an ice bucket. Besides all that, it looks stylish and is the coolest way to enjoy your wine! WINECHILL keeps your bottle of wine cool from the inside out. It keeps your pre-chilled white and rosé wines at the perfect temperature up to an hour. Also many red wines, unless stored somewhere cool, will benefit from 15 minutes chilling with the WINECHILL to bring out all the flavors. Also red wines kept in a (living) room can be easily cooled to the ideal drinking temperature by inserting the WINECHILL for 15 minutes. White, rosé or red: WINECHILL chills it to the right temperature and helps bring out all the flavors. 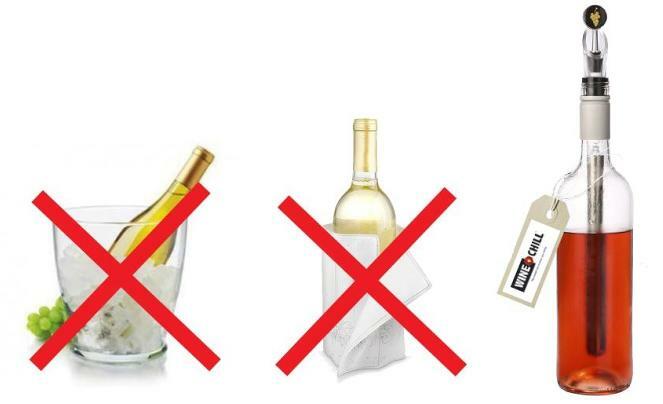 Place your WINECHILL in the freezer for at least two hours. Pour a half glass of wine to allow enough space for the WINECHILL to be inserted properly into your bottle. Insert the WINECHILL into your bottle to cool room temperature reds in 15 min or keep whites and rosés perfectly chilled up to an hour. 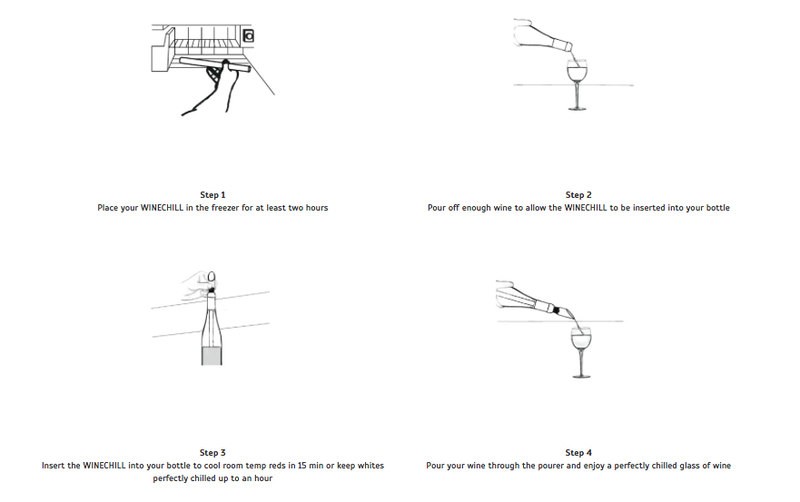 Pour your wine through the pourer and enjoy a perfectly chilled glass of wine. The aerator in the drip-free pourer adds the ideal amount of air for the optimal length of time to release a wine’s full flavors and bouquet. WINECHILL contains out of a stainless steel detachable gel-filled chiller with acrylic pourer, silicon ring for glass protection, stopper to preserve the wine. • The perfect gift for wine lovers!